Use the Instant Pot or the Slow Cooker to cook lean pork with low-sugar barbecue sauce! This Pulled Pork with Low-Sugar Barbecue Sauce is perfect for a summer meal or game-day food! Click for The Top Ten Unique and Amazing Slow Cooker Pulled Pork Sandwiches! Pulled Pork is such a great party or game-day food, especially when it’s served with a flavorful barbecue sauce to complement the flavor of the pork. But many barbecue sauces are loaded with sugar, which isn’t going to work for anyone who’s following any type of carb-conscious eating plan. This Pulled Pork with Low-Sugar Barbecue Sauce from Kalyn’s Kitchen combines your favorite sweetener with just a touch of brown sugar for that barbecued pork flavor that everyone loves with much less sugar. And you can make Pulled Pork with Low-Sugar Barbecue Sauce in the Instant Pot or the slow cooker, whichever you prefer. I bet your family and friends are going to gobble this up if you make it for a party dish. Serve the pork with Spicy Mexican Slaw as shown above, and offer rolls for those who want to make a sandwich! 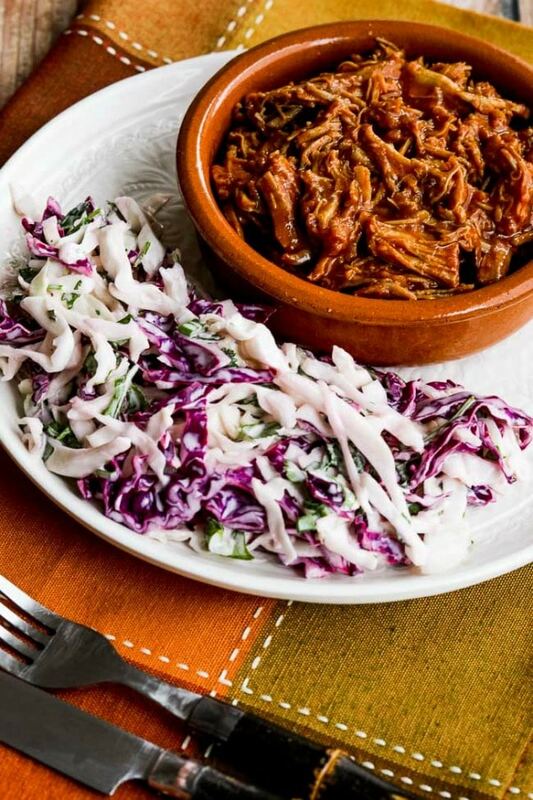 Get the complete recipe for Instant Pot Pulled Pork with Low-Sugar Barbecue Sauce from Kalyn’s Kitchen. Or make Slow Cooker Pulled Pork with Low-Sugar Barbecue Sauce from Kalyn’s Kitchen if you prefer that method!